A hole more than 33ft (10m) deep has opened up in the back garden of a house in Kent. 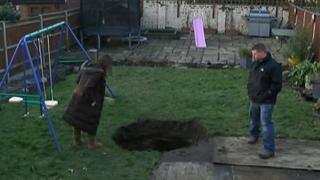 The day before the hole appeared, a "dark shadow" appeared in the garden of the family home in Gravesend. Melanie Andrews said her two daughters had been playing near it in the snow and jumping over it. The hole then appeared overnight on Wednesday. Surveyors are due to assess it next week to find out whether it has been caused by subsidence. BBC reporter Ian Palmer said the Gravesend area was known for so-called deneholes which could appear after heavy rain. Dr Helen Reeves, of the British Geological Survey, explained how deneholes appeared, and said: "What happens is you have the soil above a void in the ground and water ingresses into the ground. "It takes the soil down and obviously falls into the hollow. And you usually need an excess of water for this to happen." Mrs Andrews said: "My initial reaction was, 'where has the earth gone'? My first question was, where had such an amount of earth just disappeared to?"